Price: £0.60 (incl VAT) Sorry, this item is currently unavailable. Click here to receive notification when this product comes back into stock. 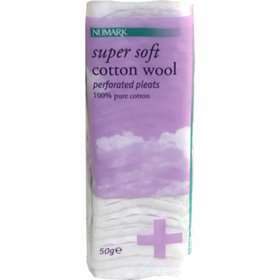 Numark Super Soft Cotton Wool are 100% pure cotton perforated pleats suitable for use on the skin. Ideal for removing make up. An essential item for your baby changing bag. These Numark Super Soft Cotton Wool Pads our made of the highest quality 100% cotton, perfect for all your skin care and beauty needs. To avoid danger of suffocation, please keep this bag away from babies, children and animals. Product code: 0197129 Price: £0.60 (incl VAT) Sorry, this item is currently unavailable. Click here to receive notification when this product comes back into stock.